Indonesia's most active volcano of Mount Merapi spewed a column of volcanic ash 6 km into the air on Friday (June 1), triggering a top alert notice for passenger planes, a government official said. Mount Merapi, situated on the border of Yogyakarta and Central Java on Java island, erupted at 8:20am (9:20am Singapore time) with volcanic spreading ash to the west of the crater, spokesman of national disaster management agency Sutopo Purwo Nugroho said. He said people living in the vulnerable zone near the volcano have also been warned to be more alert. 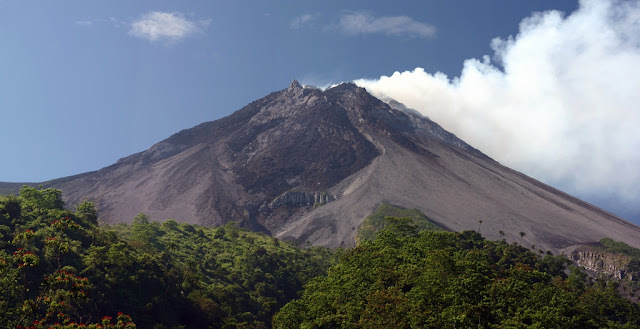 Merapi's previous eruption on May 24 had prompted the authorities to raise the alert to the third highest level, with a no-go zone of 3 km in radius from the crater, according to the agency.